One of those anti-royalist pamphlets referring to Prince Rupert’s selection of pets. His poodle Boye was also the subject of some derision but here is his monkey, presumably about the blow smoke cheekily in the face of her cuckolded husband. 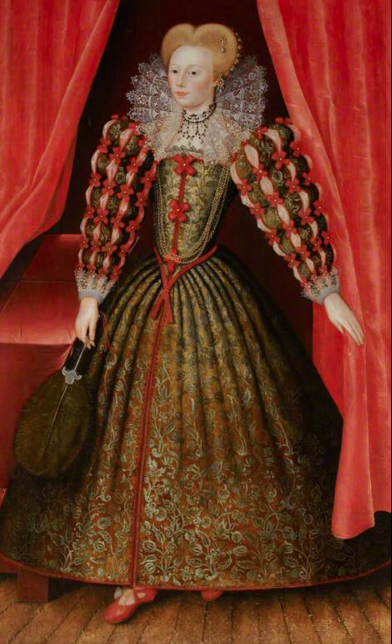 She is wearing a hood tied beneath her chin, a short petticoat effort hiding her simian modesty (this is not standard 1640s fashion as far as I can tell) and a shoulder belt for her sword. 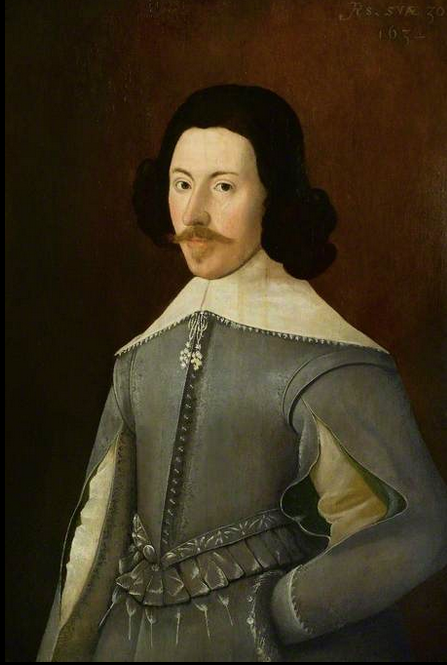 The cavalier is wearing a long buttoned coat with turn back sleeves over a short doublet and tapered breeches. His linen band is smart with a modest lace edge and his riding boots (spot the spurs) are folded in the common style to show off his boot hose. 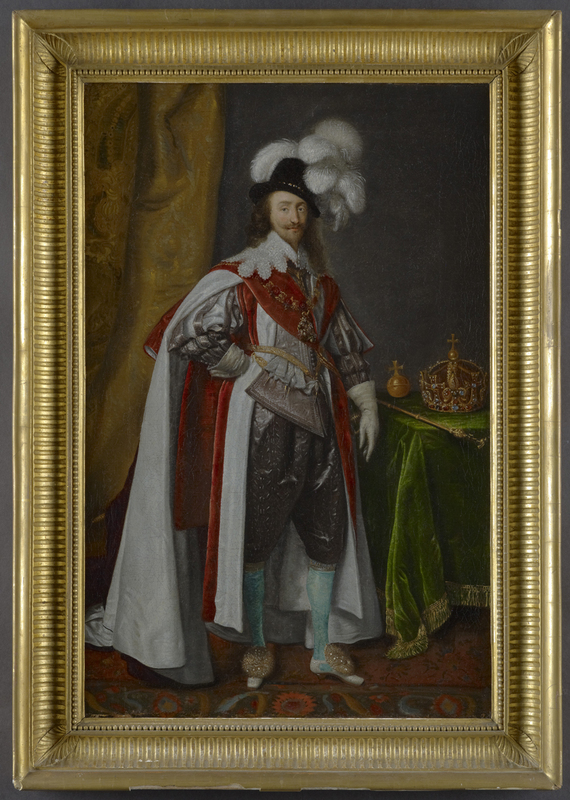 Painted sometime before 1638 by an unknown British artist, Sir John Stanhope of Elvaston Castle was member of parliament early in the King’s reign and active in politics right through the 1630s until his death in 1638. He incurred the wrath of the Sherrif of Derbyshire John Gell by refusing to pay Ship Money. Gell revenged himself in the Civil War by defacing Stanhope’s monument in Elvaston Church. 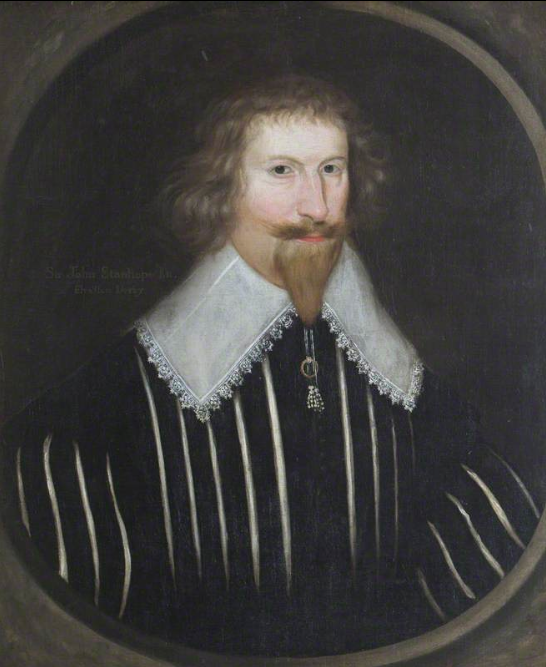 Sir John is wearing a black doublet slashed both in the body and sleeves so the linen of his shirt is easily seen. His falling band is neatly darted and adorned with some sober lace and subtle bandstrings. Notice the wedding ring worn on a string around his neck. 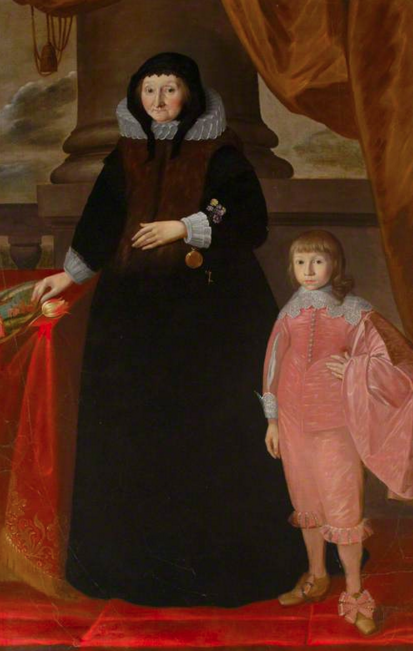 The painting is kept at the National Trust property of the Old Manor Norbury in Derbyshire. 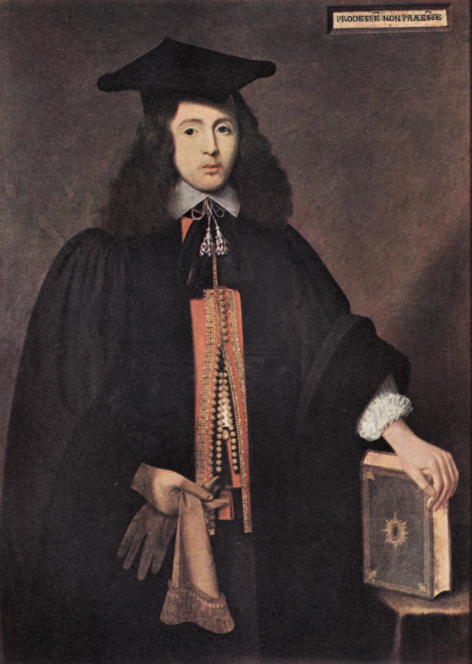 Richard is wearing his masters gown over what looks to be a doublet and waistcoat beneath, as there are definitely two layers, both heavily buttoned. On his head he wears a scholar’s square cap and a plain linen band around his neck. The tassels on his band strings appear to be made of tiny knots, rather like an example in Janet Arnold’s Patterns of Fashion 4. 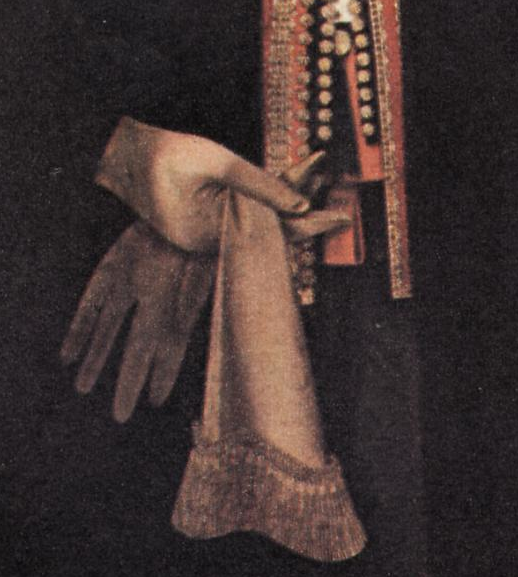 In this detail you can see the intricate work on the buttons and also the embroidery on his glove cuffs. ………wherein is martially showne the order for driling the musket and pike : set forth in postures with ye words of comand and brief instructions for the right use of the same. Sold by Thomas. Jenner (at the foot of the Exchange in London) 1642. An eight page drill book showing the standard pike and musket positions, published just before the war and including some nice plates of soldiers drilling in various costumes. These four caught my eye as they are all wearing the peaked cap with a folded outer skirt known at the time as a montero. There are scant few images of these hats from England in the 1640s, making these pictures quite rare to say the least. 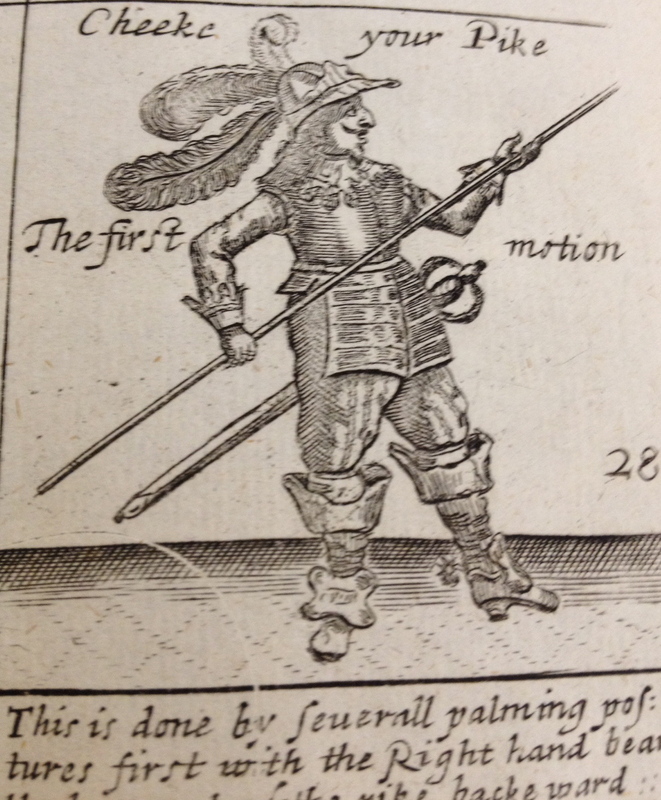 The first chap seems to be dressed as an officer in long boots, nice breeches, gauntlets, armour consisting of back, breast and tassets and laced a falling band. His cap is decorated with plumes and conforms to the officer’s style with little room in the side skirt for folding. Why would you need protection from the cold when you could just go indoors? 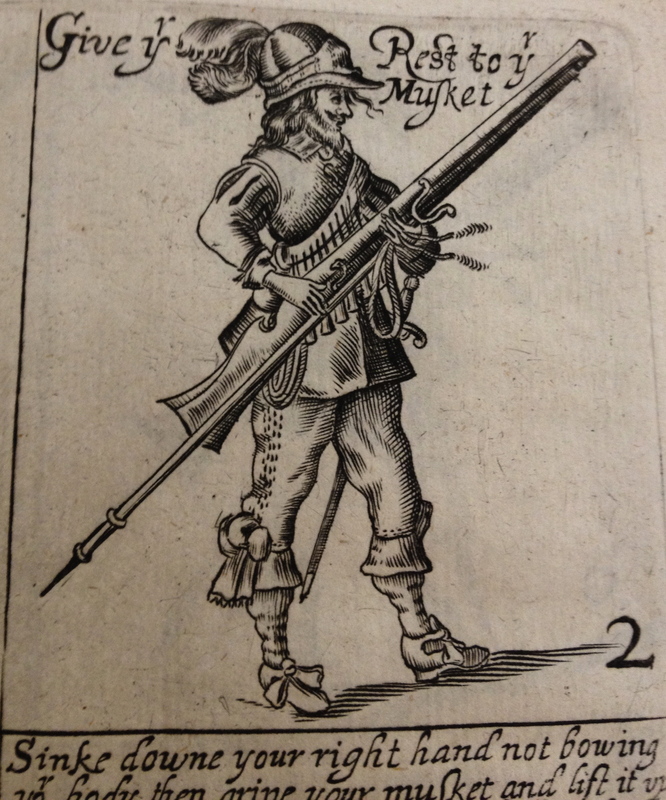 The second figure, a musketeer is dressed more plainly. Shoes instead of boots, though his hose have a turn down that echoes boot hose. His breeches are decorated with some kind of top stitching and extravagant ribbon bows. 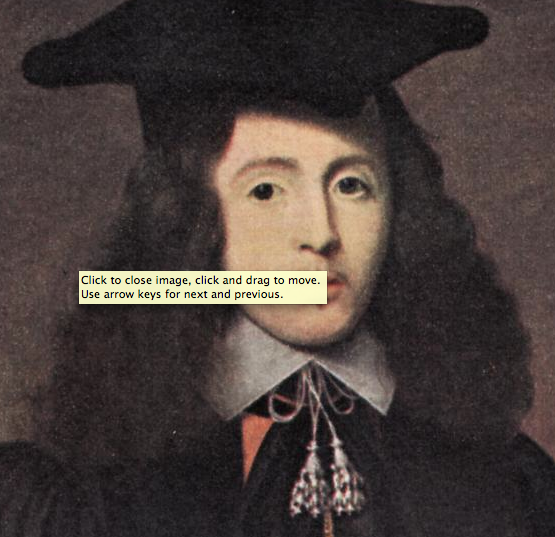 He also appears to be wearing a doublet with slashed sleeves beneath a buff coat and plain linen collar and band. The montero is also plumed, but there is more room in this one for folds in the skirt. If you look closely, there are also some stitches drawn in around the peak. 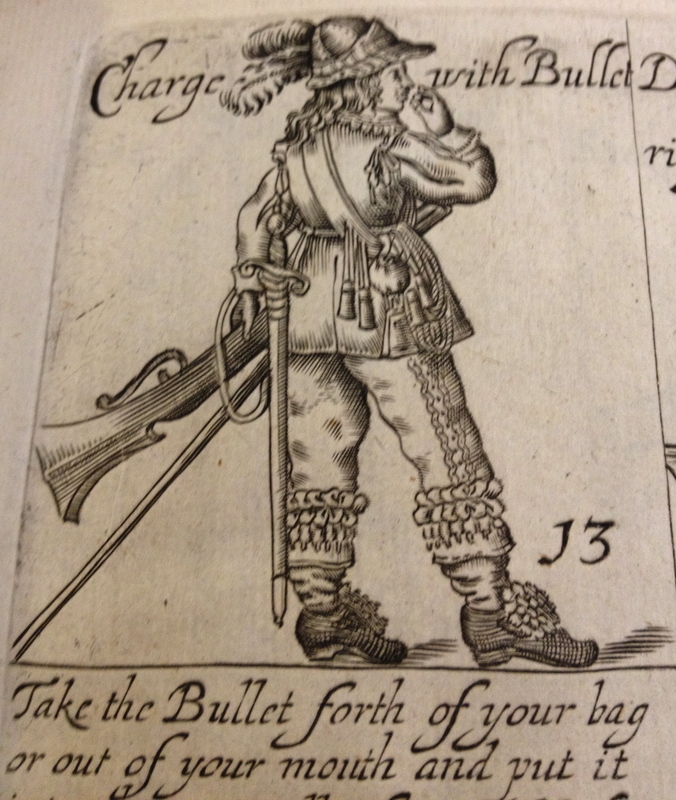 The last guy, getting ready to spit his ball down his musket barrel has quite a lot of decoration on his kit, from the ribbon rosettes on his shoes, up the laced and pointed legs of his breeches to the slashed sleeve of his doublet and laced falling band. He’s quite a dapper fellow. His montero is again six panes and some sewing is visible on the crown this time.